Would you believe me if I told you this tasted like a light and airy tropical dream? I have deep love for classic American desserts. Back in my chefy days I was always looking for ways to reinvent old-school comfort foods into fancy little fussy desserts. This recipe, broken glass dessert or stained glass dessert, has been around forever, but was new to me. I was actually researching another idea entirely when I stumbled upon it. Instantly, I knew I could take this seemingly innocent dessert in a sinister direction. 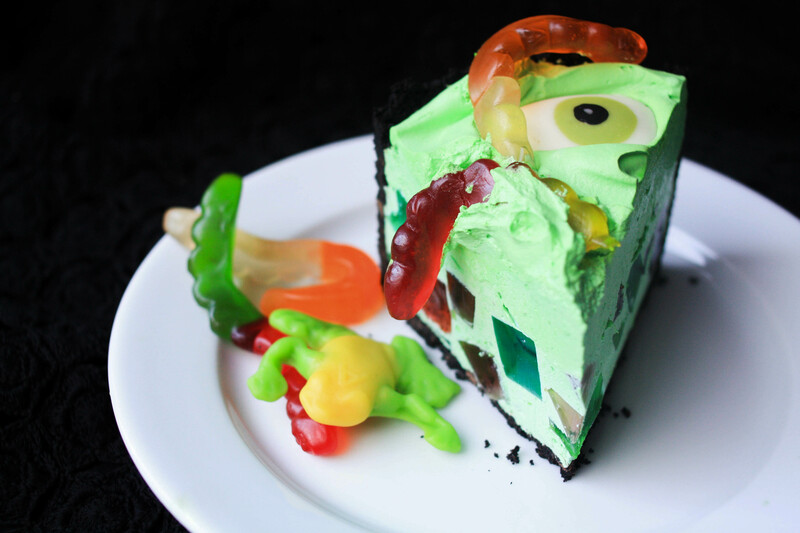 What could be more diabolical than serving up broken glass with a side of worms and eyeballs? 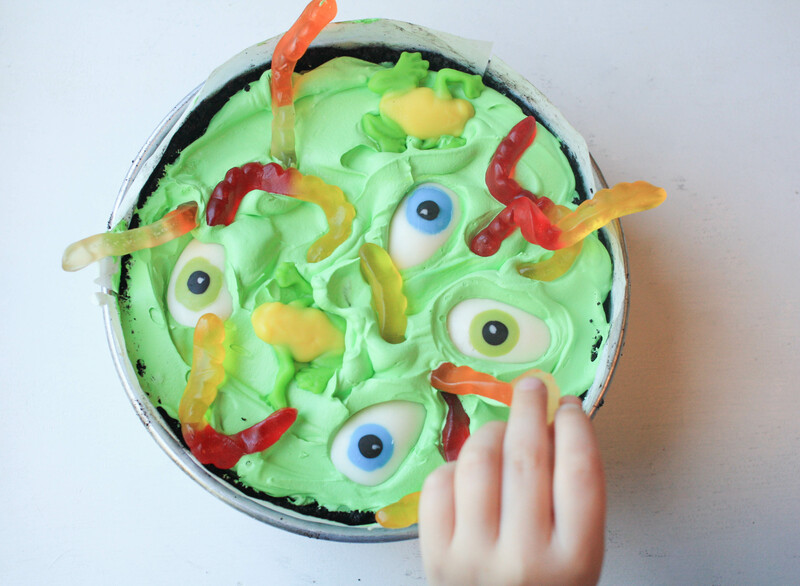 It’s ghoulish enough for the kids, but fruity and delicious for all to enjoy. A true trick or treat. I channeled my inner American housewife and opted for pure convenience when putting this dessert together. You could class it up with fresh whipped cream, homemade flavored gelatins, homemade chocolate cookies, and organic gummy candies. I’d be envious. Prepare 4 packages of flavored gelatin with half as much water as the box calls for. This will make the gelatin firm enough to cut and hold its shape, but not so firm that it’s chewy. I used lime, berry, black cherry, and grape. Pour the prepared gelatins into containers small enough so that the gelatin sets up about 1/2-inch deep. Refrigerate according to the recipe, typically for at least 2 hours up to overnight. 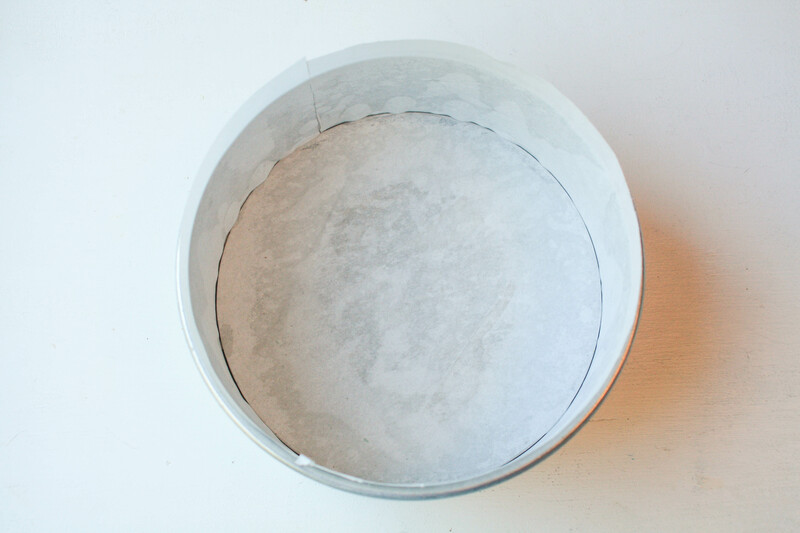 Preheat your oven to 350 degrees F. Prepare the 8-inch springform pan by lining the bottom and sides with parchment paper. Spray the pan first with cooking spray so that the paper sticks to the pan. Combine the cookie crumbs and melted butter in a medium-sized bowl. Press about half of the cookie mixture into the bottom of the pan. Use a drinking glass to press the crust down flat. 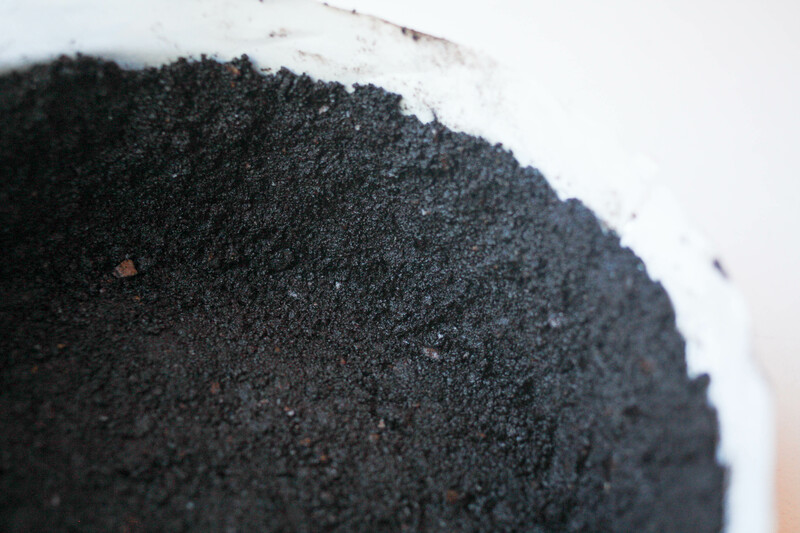 Once the bottom is lined, scoop up handfuls of the cookie mixture and press the crust up along the sides of the pan. This is probably the fussiest step of the whole recipe, but totally worth it for that cauldron look. 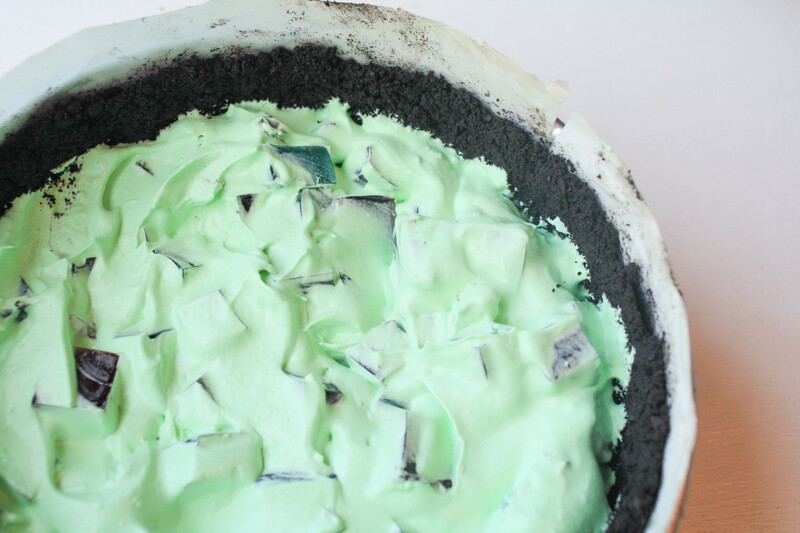 You could also just use a pre-made crust and call it broken glass pie. Either way, it works. If you do use a pie crust then you’ll only need half of the filling. Bake the crust 10-12 minutes. Set aside to cool completely before adding the filling. 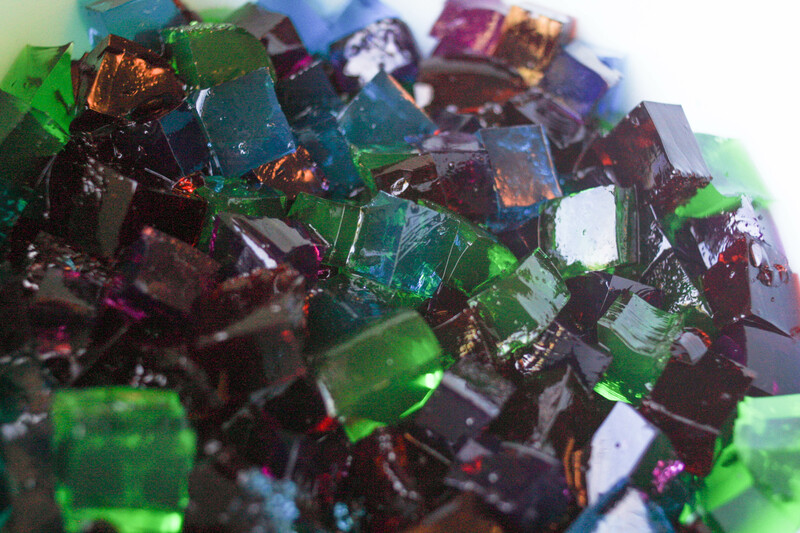 Chop the chilled flavored gelatin into cubes. Reserve 2 cups of cubes for your filling. Save the extra cubes to garnish slices or for guests who aren’t doing dairy. Combine one package of unflavored gelatin with 1 small can of cold pineapple juice in a heatproof bowl. 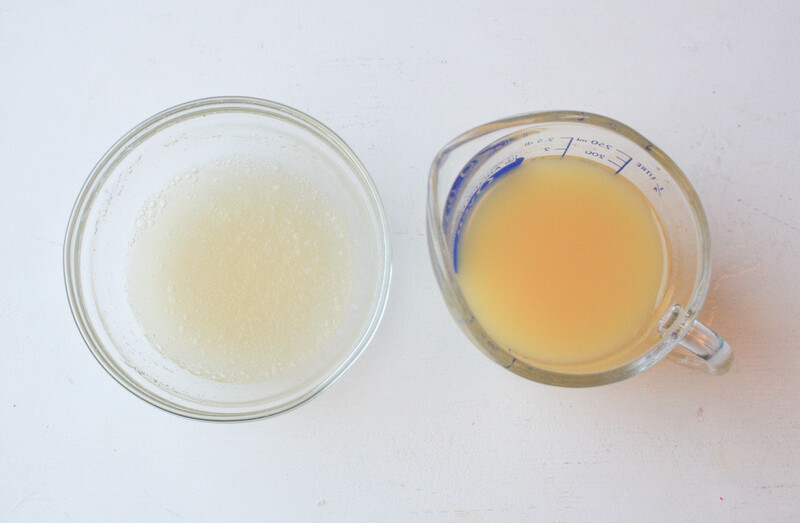 Once the juice has absorbed all of the gelatin, microwave the bowl for 10-15 seconds, or until the mixture is liquid. 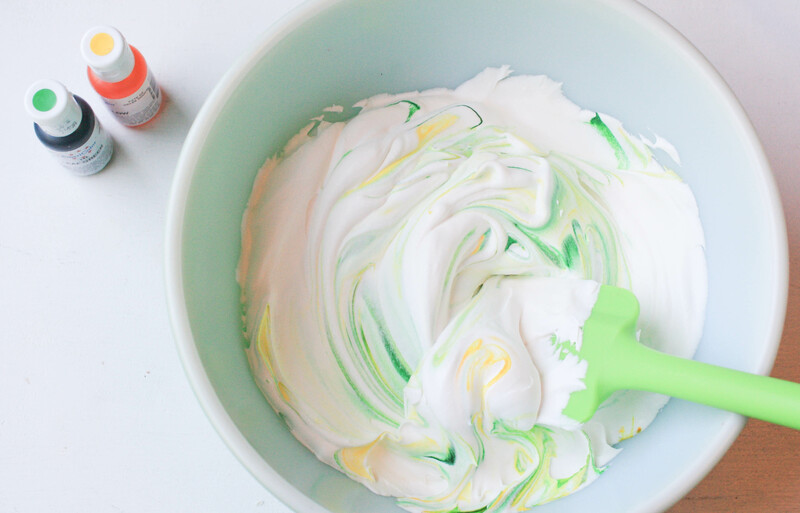 Fold the melted gelatin mixture into the whipped topping or cream. 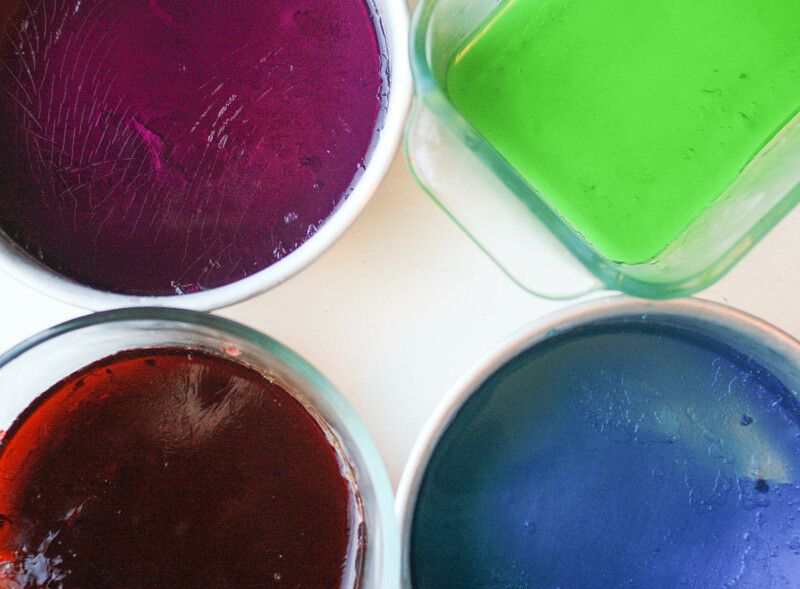 Stir in enough green food coloring to achieve your perfect shade of slime. Add a drop or two of yellow to make your slime look just a little more radioactive. Set aside a little more than a cup of the green cream mixture. 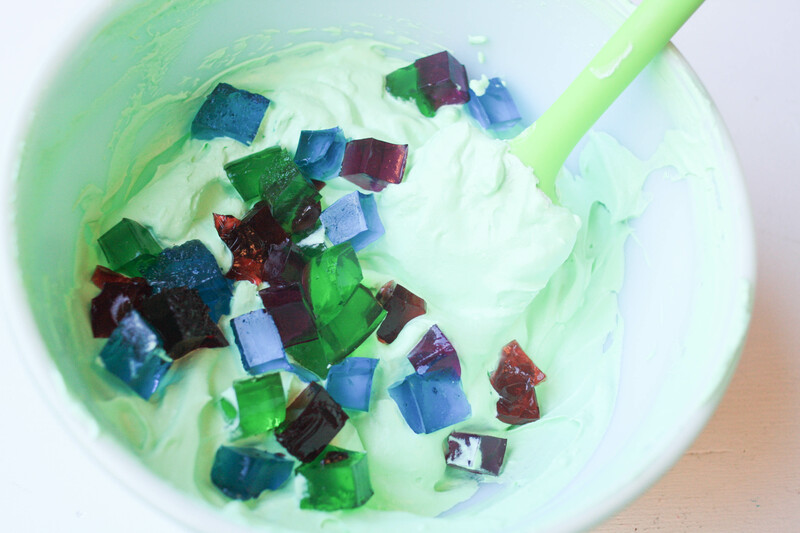 Fold the gelatin cubes into the rest of the mixture and pour the filling into the cooled crust. Spread the reserved cream on top of the filling. 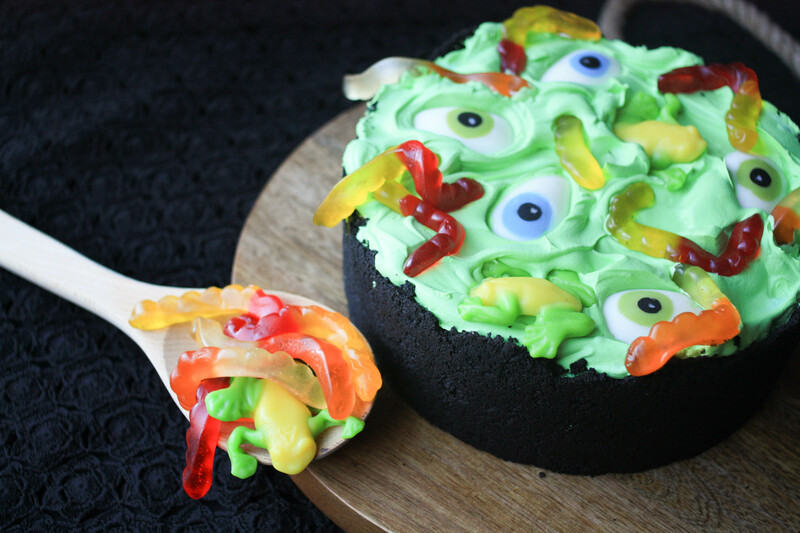 Decorate with all things edible and creepy. 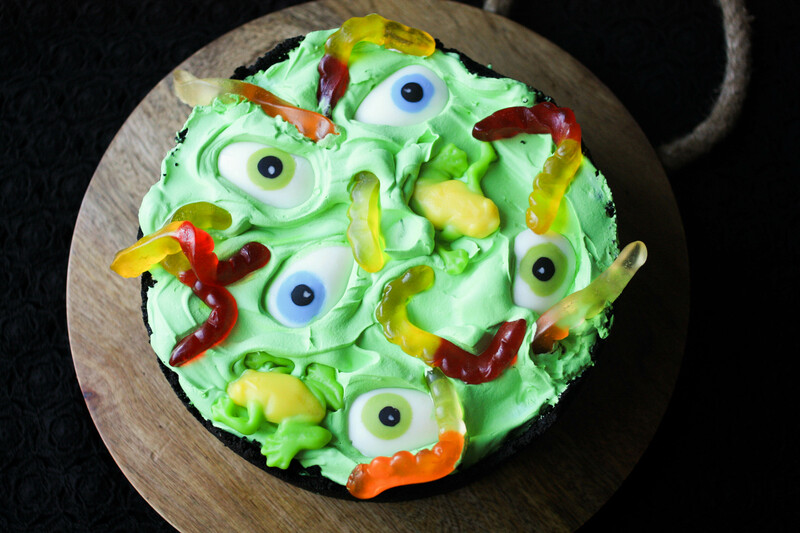 I used gummy worms, gummy frogs, and my own chocolate eyeballs. 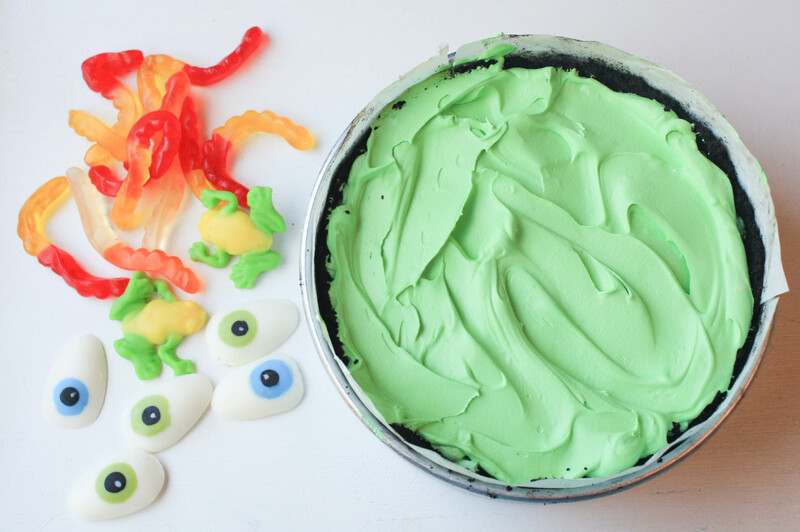 Learn how to make those here: chocolate eyeballs. Chill for at least 3 hours, ideally overnight. 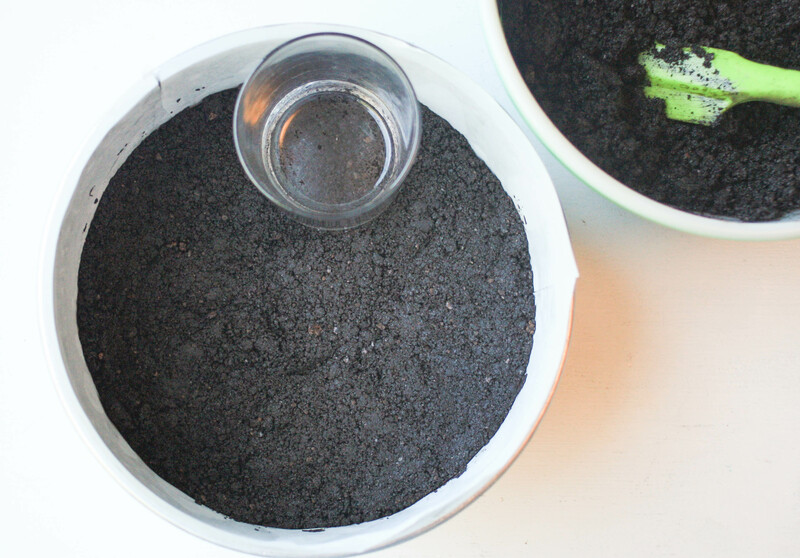 Once chilled, slide the finished dessert out of your springform pan and onto a serving platter. For the cleanest slices dip your knife in warm water, then wipe with a towel after each cut. 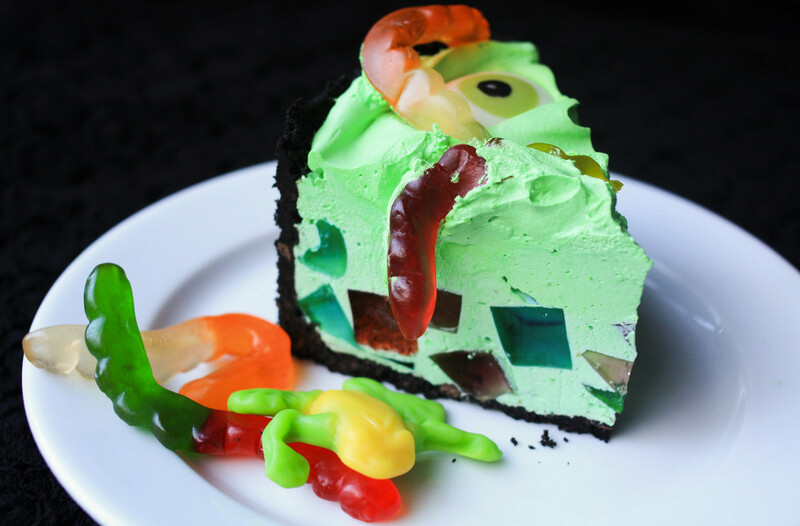 Garnish slices with extra gummy critters or leftover gelatin cubes. Make this ahead and store covered in the fridge for up to 5 days, although your crust might start to get soggy after 3 days.